SAN FRANCISCO - As Giants executives and the team's stars talked about Bryce Harper on Friday morning, a veteran stood in one corner of the sprawling room on the suite level at Oracle Park and pointed to Dereck Rodriguez. "Those are the types of guys I'm really thinking about," he said. Harper will get his payday, whether it's tomorrow or in March, $250 million or $350 million. He'll be fine. Same with Manny Machado. The Giants who gathered Friday at Oracle Park had a general sense of dissatisfaction with the kinds of offers Harper and Machado have received as two of the best free agents in MLB history, but the list of concerns goes much deeper. Buster Posey and Brandon Crawford mentioned how many other quality free agents remain out there. Several of Nick Hundley's former teammates quietly grumbled that the popular catcher was sorting through minor league deals. Many of the players in the room talked of the need for change, none more forcefully than Jeff Samardzija. He spoke passionately about the need to overhaul a system players believe is broken. This is where someone like Rodriguez comes in. He broke through last season at the age of 26, but as a pre-arbitration player, he's likely to simply have his contract renewed at or near the MLB minimum. Perhaps Rodriguez will get a raise of a few thousand dollars, but he's two years from being able to get a real bump in arbitration, and he won't be a free agent until after the 2024 season. For years, players have slogged through all of this knowing they would cash out as free agents. That's no longer the case. "We're going to have to get arbitration moved up a year earlier and get guys to free agency earlier," Samardzija said. "It seems like there might only be one way to get that, but we'll see. Hopefully it doesn't come to that because we want to keep the fans happy. We want people coming to the stadium and watching a great product, but they need the best product available, and having 50 guys sitting at home that are big league players is not the best product." 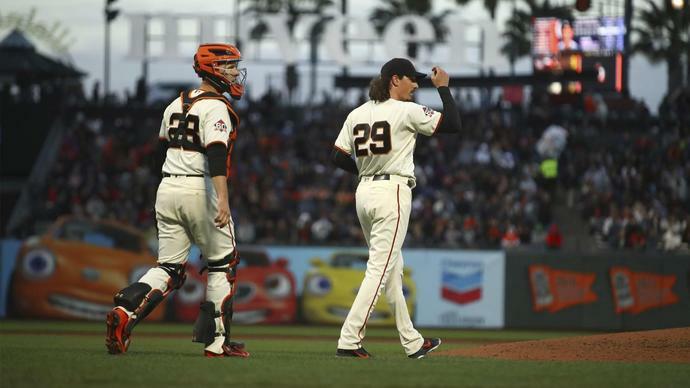 "You know, striking is the last thing you want to do, but you have to be willing to do it," Samardzija said. "But I think there are other things before then that can get the ball going the right way. Part of that involves getting the game's biggest stars involved, and that's already happening. Evan Longoria has taken to Instagram and Twitter to advocate for change. Buster Posey, who usually stays away from any hint of controversy, tweeted about the situation on Friday. A day later, he doubled down. "Somehow the notion that it's okay not to be competitive for any window of time has become acceptable," Posey said onstage at FanFest. "That's my issue." The increased chatter -- Justin Verlander of the Astros joined in Monday on Twitter -- has been noticed. Giants president and CEO Larry Baer spent the middle of last week at owners meetings in Florida, and said the concerns will be addressed. "If this is a market that doesn't work then we've got to change the system in ways that maybe work better," Baer said. At the same time, the owners and players agreed to this CBA, and Baer pointed out that they're just two seasons into a five-year deal. The players were caught off guard last offseason. This offseason they have grown angry, but front offices are unlikely to start operating in a different way. They mostly have come to the same conclusion in recent years. "You have a lot of really accomplished free agents still out there, but our job is less about what a player has done in the past and more about what we think they're going to do going forward," new president of baseball operations Farhan Zaidi said. "I think that's some of the slowdown that you see in the market, is players valuing themselves based on what they feel they've earned in their careers and front offices maybe being a little more oriented towards what can we expect for this player in 2019 and going forward." Zaidi has shied away from big contracts throughout his front office career, but he is currently trying to bring Harper to San Francisco. If that chase fails, ownership and the front office could hear increased grumbling from the clubhouse. The Giants have committed less than $10 million to free agents this offseason, and for the players, that's not an encouraging sign. On Tuesday, pitchers and catchers will take the field at Scottsdale Stadium and officially begin their season. A week from now, position players will join. They'll smile and joke and enjoy the fact that they're getting paid to play a game they love, but in quiet moments, you can expect the business discussions to continue. Players are concerned about the direction of their game, and that'll be a part of the story of this season, and possibly the two seasons that follow. "Everyone kind of went along with it last year because (teams were) saying Machado and Harper are going to be available and we want to save funds for that," Samardzija said. "Well, now that's happened. I'm sure every team knows whether they're in or not on Machado or Harper, so they can allocate their cash elsewhere, because I'm pretty sure a lot of teams know they're not getting them. But then they're not allocating that cash elsewhere, which they said they were going to do. "To me, they're just taking a tactical approach as owners to shorten the window for guys to sign, and (they hope) two things come from it. They get guys to panic and sign bad deals as veterans, and also they get guys to sign pre-arb deals because they don't want to test the waters of free agency. That's what's happening now. Hopefully as players we can get on the same page and figure out how we ourselves can change the rhetoric of what's going on."